This exhibition in the Architecture Gallery of the Irish Architectural Archive celebrates the fiftieth anniversary of the US Embassy building in Dublin. 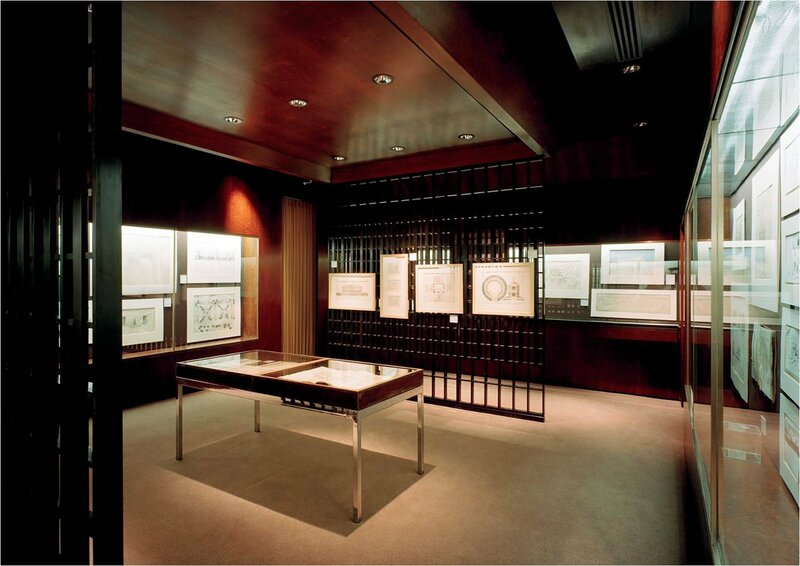 Featuring copies of original drawings for the building by John Johansen held in the Avery Library, Columbia University, New York, and photographs taken in 1964 by the noted architectural photographer Norman McGrath, the exhibition will run until January 2015. Exterior, US Embassy, Dublin. Photo by Norman McGrath. 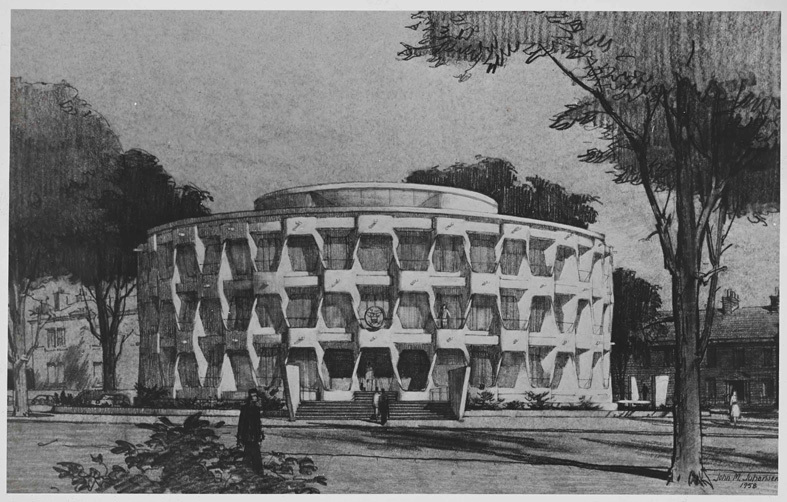 John MacLane Johansen (1916-2012) was retained to design the Dublin embassy in November 1956. One of the so-called ‘Harvard Five’ (the others were Marcel Breuer, Landis Gores, Philip Johnson and Eliot Noyes) Johansen had opened his own practice in New Canaan, Connecticut, in 1948. He was appointed professor of architecture at Yale in 1955, but the Dublin Embassy ranked as a major commission; up to that point he had, by his own admission, designed ‘only houses’. 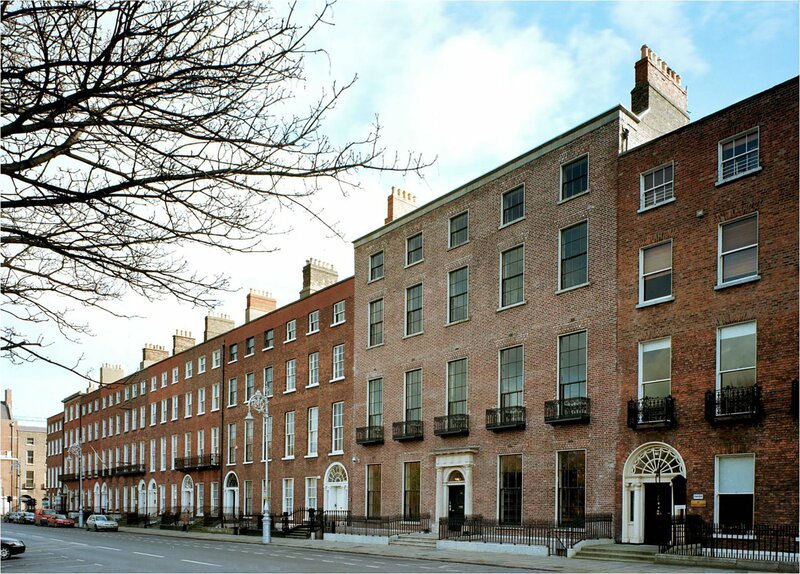 Johansen attributed his selection to ‘my earlier reputation as a classicist’, a perception he found it expedient to confirm in drawings for the project which establish a direct line from the caryatids of the Erechtheion, via Leonardo da Vinci, to the ‘Schokbeton’ precast concrete elements which make up the Dublin embassy façade. Detail of facade, US Embassy, Dublin. 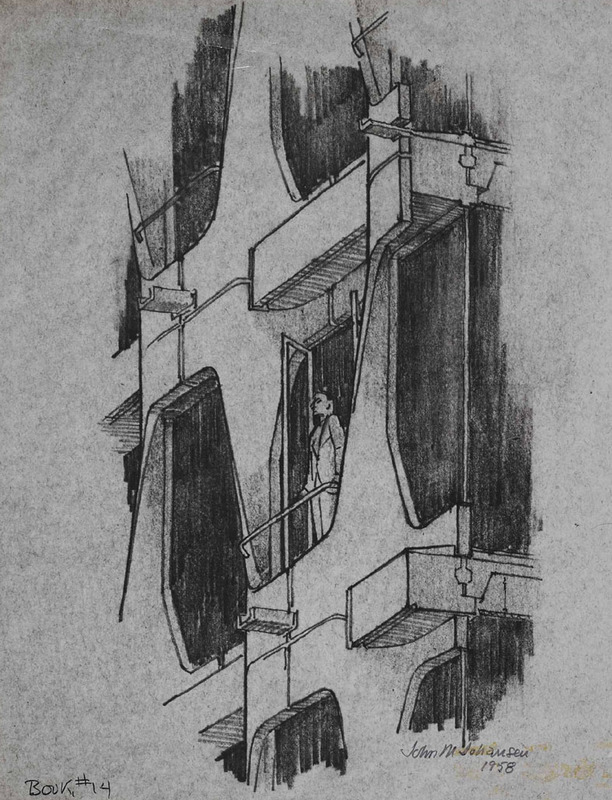 Drawing by John Johansen, The John Johansen Collection, Avery Architectural and Fine Arts Library, Columbia University. The project was beset with problems for several years. A harbinger of the troubles came early when Representative John Rooney of Brooklyn publically described the proposed Ballsbridge location as a ‘slum’. The design went through several stages – a number of the early proposals are shown in the exhibition – before the final cylindrical scheme emerged, inspired by ring forts and Martello towers. The shape of the building was also a response to its purpose and site: ‘an inoffensive “diplomatic” neo-Renaissance building was called for’, Johansen recalled, ‘so I created an updated example of the traditional rotunda building with arched exterior’. Security and privacy concerns were addressed by a broad dry moat, while a circular plan ‘provided a good solution to an awkward wedge-shaped site’. Perspective view, US Embassy, Dublin. 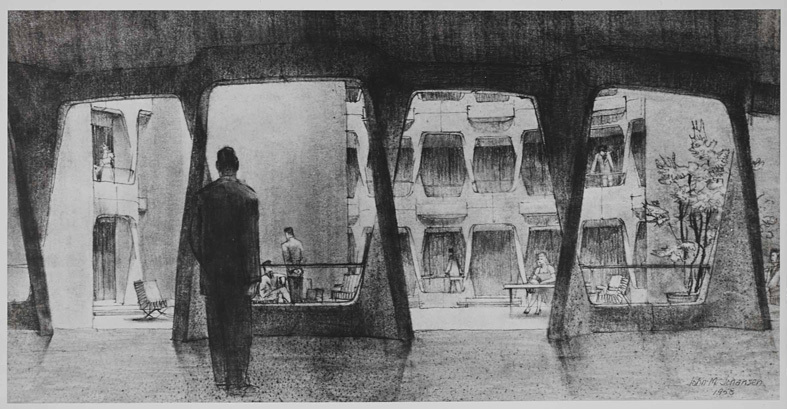 Drawing by John Johansen, The John Johansen Collection, Avery Architectural and Fine Arts Library, Columbia University. Interior perspective, US Embassy, Dublin. Drawing by John Johansen, The John Johansen Collection, Avery Architectural and Fine Arts Library, Columbia University. Political infighting and budgetary issues delayed the project, and almost derailed it completely. It took the arrival of John F. Kennedy in the White House to rescue matters. Johansen personally showed Kennedy his designs and with Presidential endorsement ground was finally broken in 1962. The building was completed in May 1964. The main contractors were G & T Crampton, with the precast elements coming on barges from Holland. The executive architects were Michael Scott & Partners. The building was opened on 23 May 1964, an occasion Johansen remembered as a ‘free whiskey party for some 300 tipsy Dubliners’. 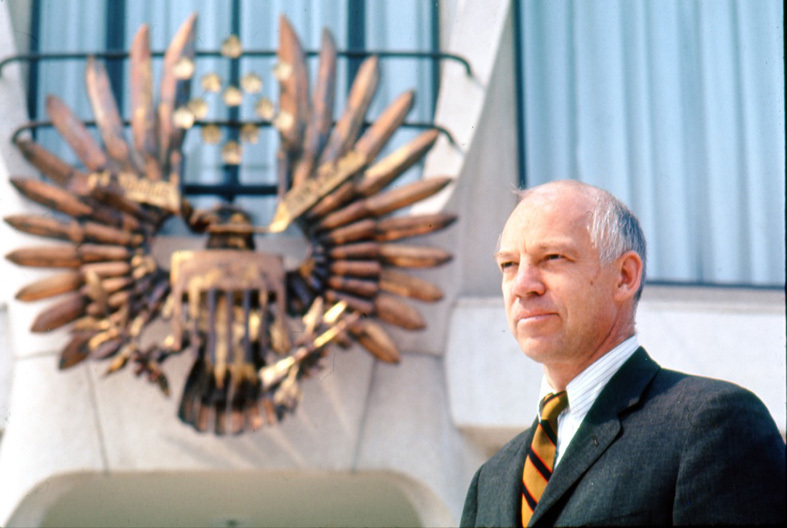 John Johansen outside US Embassy, Dublin, 1964. Photo by Norman McGrath. 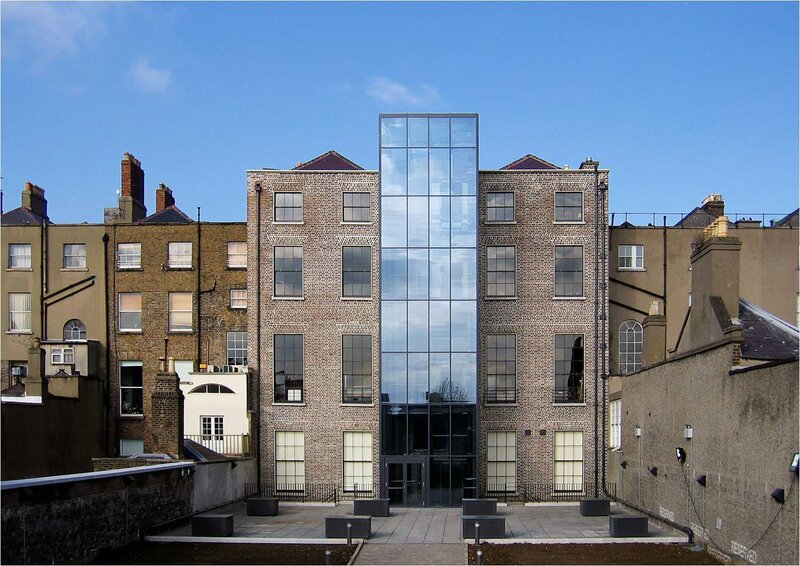 On completion the building was broadly welcomed, with voices as diverse as the Architectural Review, Time Magazine, the Irish Builder, the Irish Times and An Taisce uniting in enthusiasm and praise. Deploying the most advanced concrete technology available, Johansen delivered a career milestone, a distinctive, refined and elegant structure, unabashedly modern, even American, yet respectful of surroundings and location. 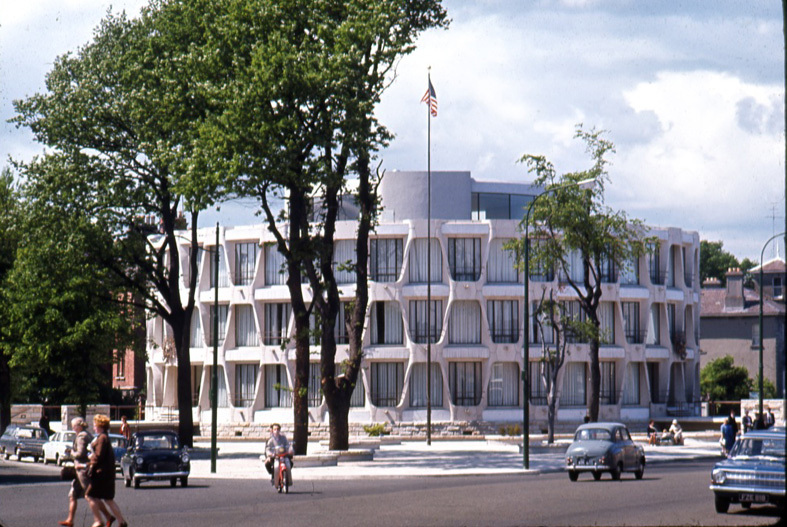 As accomplished as any building in the US embassy programme of the 1950s and 60s, and far better than most, its context has changed due to prevailing security concerns but the embassy remains after fifty years an icon of modern architecture in Dublin. And unlike so many of its contemporaries, it continues to fulfil the function for which it was designed. 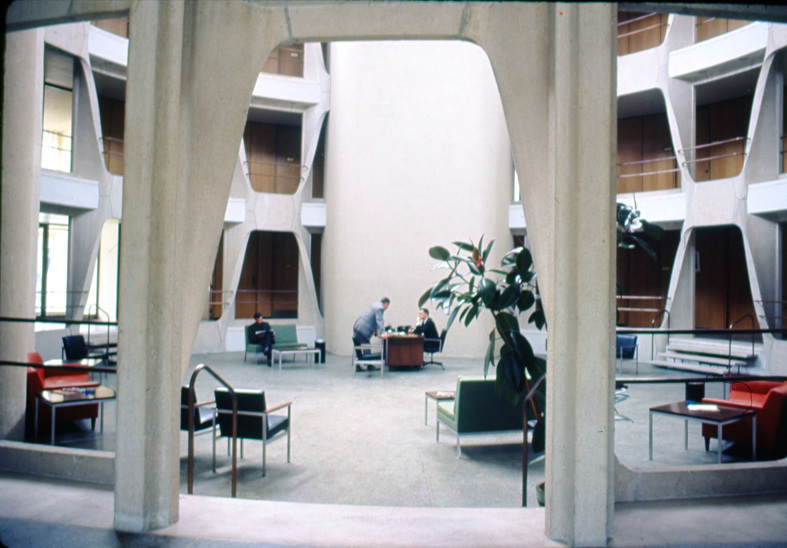 Interior view, US Embassy, Dublin. Photo by Norman McGrath. The Irish Architectural Archive would like to thank the following for their help with this exhibition, Susan Cleary, Katie Keogh, Shane O’Toole, Norman McGrath, Janet Parks, and the ESB. We are especially grateful for the cooperation and support of the US Embassy in Dublin.